Carnival Vista is a cruise ship built for Carnival Cruise Line, which was delivered on April 28th 2016. Sea trials were completed in March 2016. The ship’s maiden voyage is set to embark on May 1, 2016 from Trieste, Italy on a 13 day Europe Cruise that ends in Barcelona, Spain. By gross tonnage, she will be the largest ship within Carnival Cruise Lines’s fleet. The ship is under construction in the Fincantieri shipyard of Monfalcone (Gorizia) and will be expected to be delivered by April 2016. Carnival Vista is the first Carnival cruise ship fitted with ABB Azipod propulsion units since the 2004-built Carnival Miracle. Vista will operate an inaugural season in the Mediterranean from May to October 2016 before repositioning to New York to offer a pair of round trip cruises. She will then move to her new homeport in Miami in November 2016 where she will sail year around. She will offer 6 and 8 day Caribbean cruises with ports of call such as Ocho Rios, Grand Cayman, Cozumel, Aruba, Curaçao, and Bonaire. 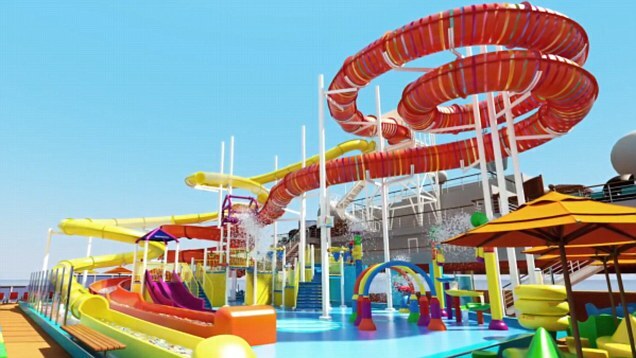 Carnival Vista will have outdoor spots like Havana Bar & Pool, SkyRide at SportSquare (an 800-foot-long track suspended around its top deck that passengers can circle in pedal-powered capsules), and Seafood Shack plus plenty of spaces like the first IMAX at sea. The Vista has custom Cuban themed staterooms and new Family Harbor staterooms. The Clubhouse features indoor activities like mini-bowling and arcade-style basketball, soccer, volleyball and table tennis. 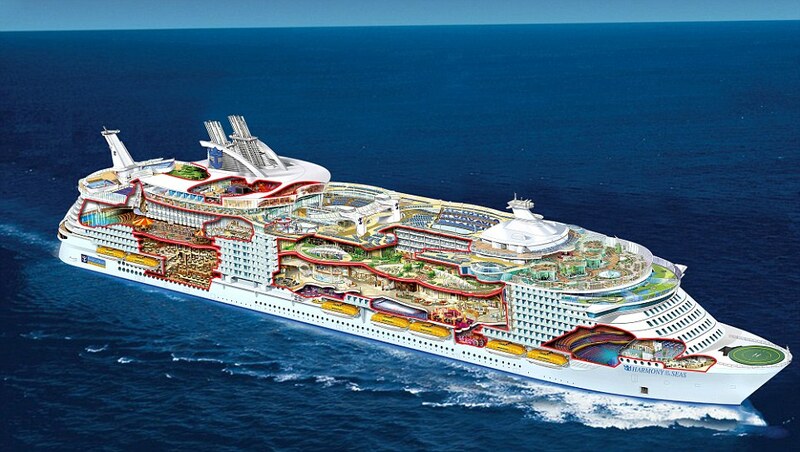 The ship will also have SkyGreens, a mini golf course on Deck 12. 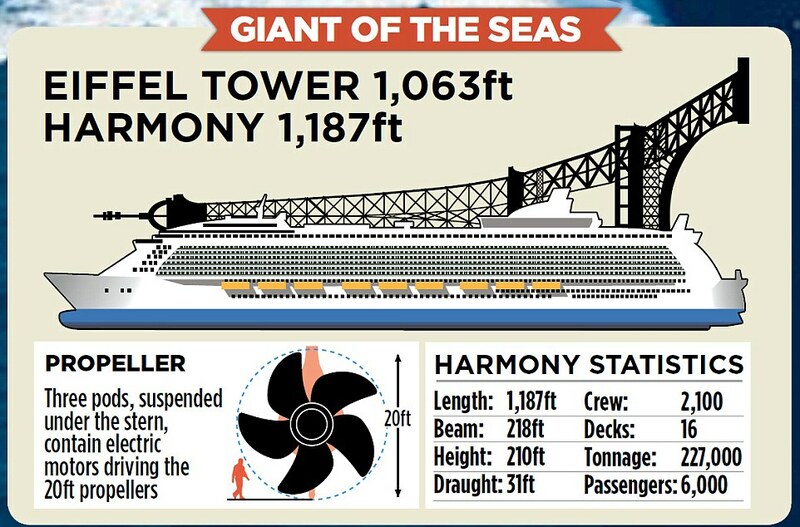 Monster of the deep: World’s largest cruise ship is so vast that guests will have to use GPS to find their rooms! 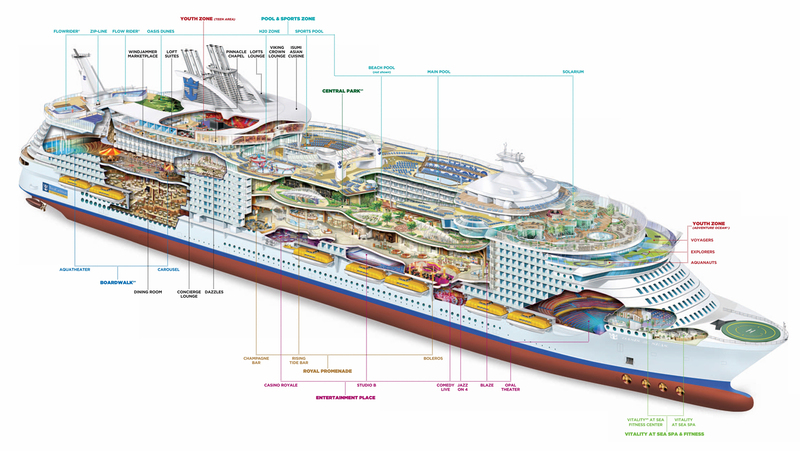 Such is the scale of the quarter-of-a-mile long Royal Caribbean International ship, when its first 6,000 passengers board in Southampton in May they will be issued with GPS-style wrist trackers so they won’t get lost in her labyrinthine interiors. And a squad of ‘Royal Genie’ butlers will be at the beck and call of VIP guests. 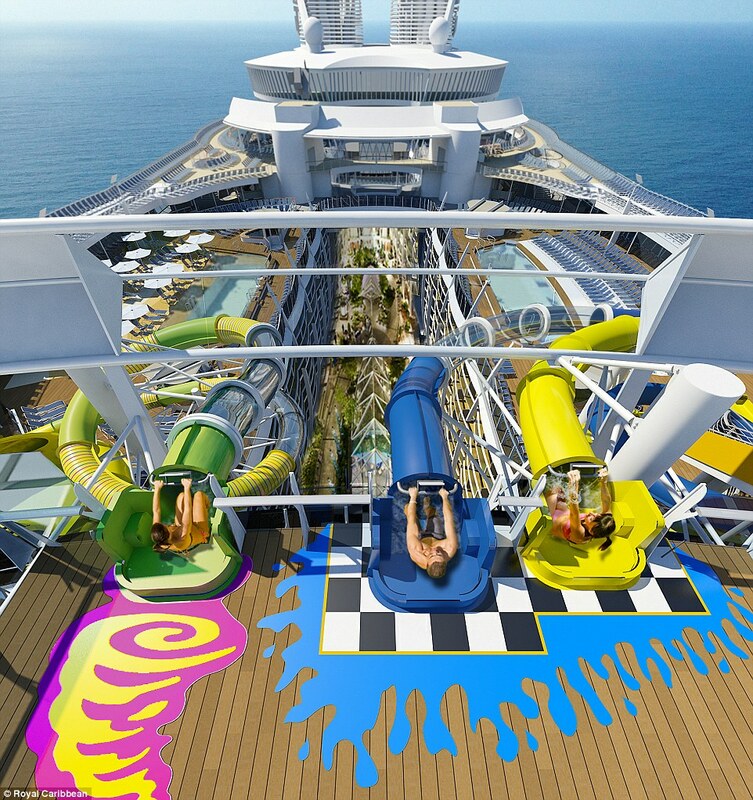 Thrill seekers will be able to choose from four onboard slides, including the Ultimate Abyss, the world’s tallest slide at sea, boasting an impressive 100ft plunge. Elsewhere, a zipwire will whizz adventurous guests nine decks above the open-air atrium, robots will pour cocktails at a ‘bionic bar’, and passengers can learn to surf on a ship-board wave simulator. Entertainment includes Broadway’s hit musical, Grease in the full-size theatre, a state-of the-art multimedia ice rink spectacular and high-flying acrobatics. The ship has 16 restaurants and cafes – including a Jamie’s Italian – boutique shopping on the Royal Promenade, and high-speed wi-fi in the staterooms. And for voyagers wanting a challenge, there’s the Escape Room where guests have to try to break out by solving a series of puzzles. 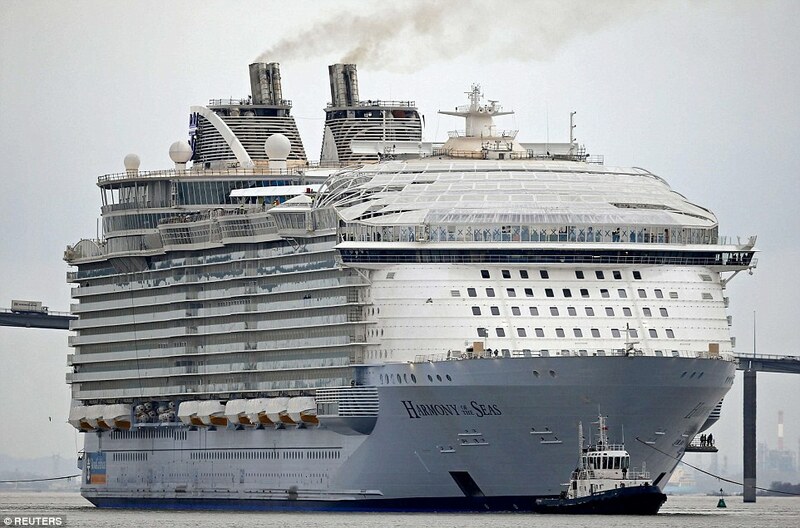 Vast and full of surprises, Harmony Of The Seas is like something from the imagination of Jules Verne. It seems like U.S. agents are having to wait longer to see brand-new ships, or to send their clients on them, unless they want to fly to Europe. Nearly all the ships coming out of European shipyards this year will be dedicated in Europe and spend the summer and fall sailing there. The exception is the Seabourn Encore, which will be even farther away, in Singapore, when it is christened next January. Once the primary window for ships to be delivered was in the fall, when they could be pressed into service in the Caribbean. That was the case in November when the Norwegian Escape was christened by Pitbull and began a series of cruises from Miami. But while the Carnival Vista, the Koningsdam and the Harmony of the Seas will all arrive in South Florida in November, and will have occasions for travel agents to tour them or sail on them, they will be six months into their service by the time that happens. I don’t know when the shift began. Clearly the larger cruise lines have enough ships in their fleets that leaving newbuilds in Europe for the summer doesn’t disrupt their plans for North America. That may be different from the past, when every ship counted in the strategy to beat the competition. And it may be good luck that Carnival Cruise Line, Royal Caribbean International and Holland America Line have some of their most attractive ships in Europe at a time when that region needs a boost. Ironically, the next big ship introduction scheduled for North America comes in November 2017 when a European-based cruise line, MSC Cruises, debuts its MSC Seaside in Miami.